Dr. Killian (formerly of ONR) going to Office of [?] Ordnance Research at North Carolina ------------------------------------------------------------------------ Jackson Laslett of Ames going to O.N.R. 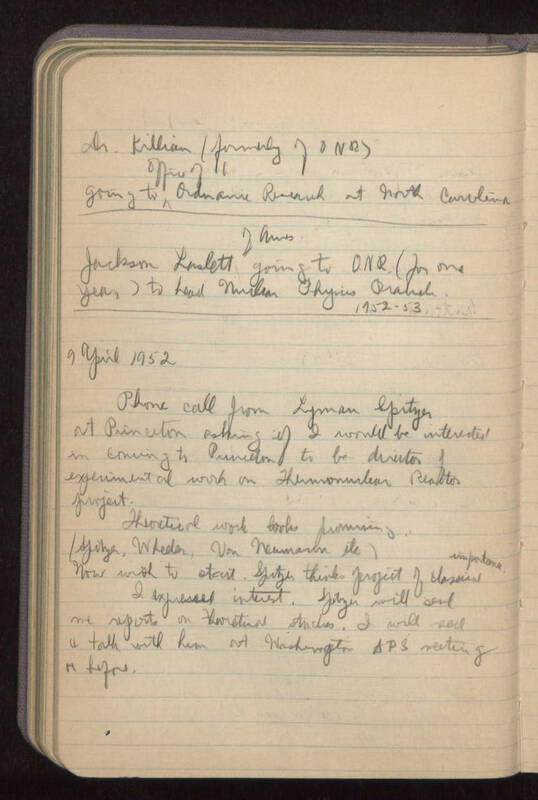 (for one year) to head Nuclear Physics Branch 1952-1953 -------------------------------------------------------------------- 9 April 1952 Phone call from Lyman Spitzer at Princeton asking if I would be interested in coming to Princeton to be director of experimental work on Thermonuclear Reactor project. Theoretical work looks promising (Spitzer, Wheeler, Von Neumann, etc.) Now wish to start. Spitzer thinks project of classical importance. I expressed interest. Spitzer will send me reports on theoretical studies. I will read and talk with him at Washington APS meeting or before.